History is replete with the achievements of humanity in various fields, ranging from curious art to complex mathematics; from the simple pleasures of life to the variegated bouts of exploration. The following list aims to cover some of the interesting man-made historical ‘objects’ that mirror such feats of human civilization in their own idiosyncratic manner. Note* – The list also covers objects that are BELIEVED to be the oldest in their field because of popular (and credible) hypotheses. Front profile of the statuette. Credit: Petr Novák, Wikipedia. 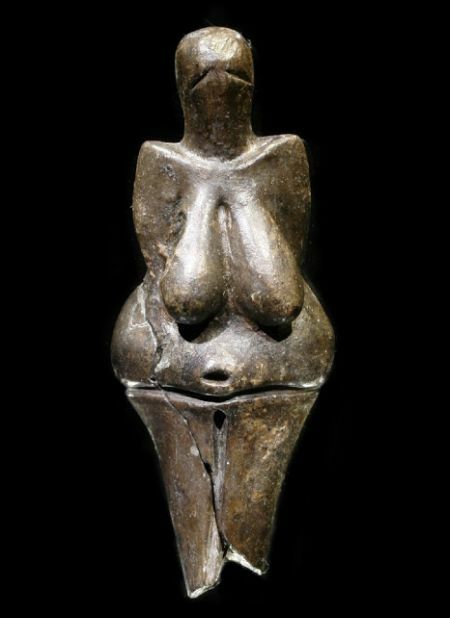 Known as the Venus of Dolní Věstonice, the 11-cm high statuette corresponds to the Gravettian culture of the Upper Paleolithic period. And, the morphology of the fascinating object clearly resembles the other Venus figurines from the Paleolithic era, whose findings stretch all the way from Europe into Eurasia. As for the specific scope of the Dolní Věstonice site (south of Brno, in the Czech Republic), archaeologists had also discovered a range of different figurines in the area, including that of bear, lion, mammoth, horse, fox and owl. All of these specimens were made from burnt clay that was possibly fired at relatively ‘lower’ temperatures of 500 to 800 degrees Centigrade. Interestingly enough, in a recent analysis, historians have been able to unravel some of the hidden features of the oldest known ceramic artifact, with the aid of a 3D microscope (possessed by Brno’s FEI Technological Institute). One of the primary features they were able to reveal from the scanning related to the structural section of the prehistoric object. To that end, as opposed to multiple two-three segments of clay, the scientists found out that the Venus of Dolní Věstonice was adroitly crafted made from a single piece of clay. I used digital technology and I created 3-D models of the holes, and it is now quite clear that they are all produced by one tool with a relatively sharp tip. They resemble the point of bird feathers, which is what Karel Absolon thought. Now I want to print the models in a 3D printer. Then it might be possible to find which bird species feathers were used. It is really quite interesting. Tall and slender – the Shigir Idol stands proudly with its height of 9.2 ft at the Sverdlovsk Regional Museum of Local Lore, in Yekaterinburg, Russia. And historically, this impressive work of art is actually more than twice as old as the Great Pyramid (while being 6,000 years older than even Stonehenge), thus making it the oldest known wooden sculptural project in the entire world. And the odd part was, instead of some high-end complex or burgeoning settlement, the antediluvian statue was originally discovered (in fragments) in a peat bog in 1894, at a depth of 13 ft, on the eastern slope of the Middle Urals. And even more tantalizing is the notion put forth by some researchers that relates to how the sculpture possibly carries some form of ‘encrypted code’. 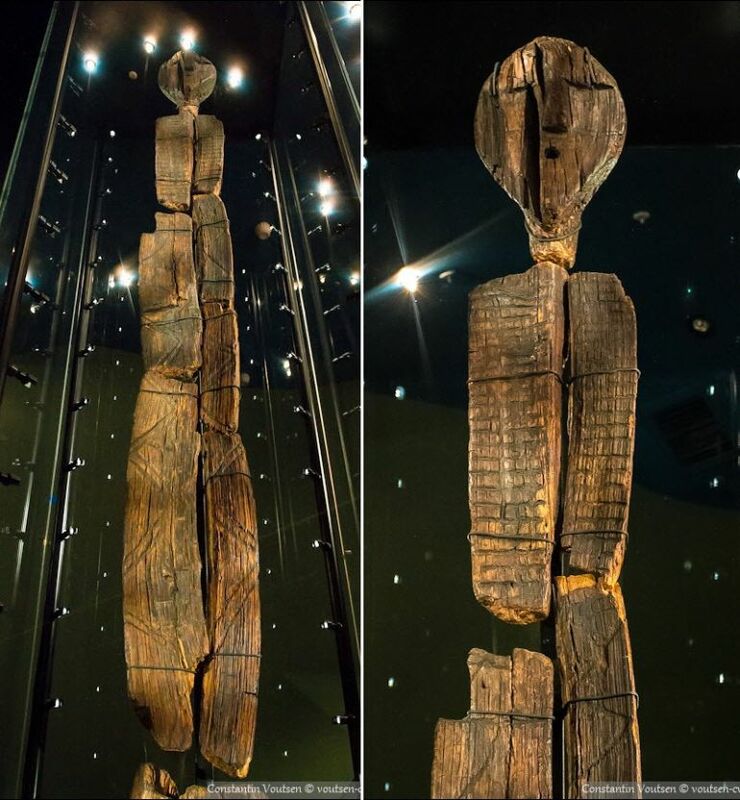 The incredible age of the Shigir Idol was actually determined in a precise manner by a group of German researchers in 2015, with the use of advanced methods like Accelerated Mass Spectrometry. On further analysis, the scientists also noted how the wooden statue was made from a phytoncidic larch, and the tree itself was around 157 years old. Quite fascinatingly, while the extant height of this specimen is about 9.2 ft, some historians (including Siberian early 20th-century archaeologist Vladimir Tolmachev) believe that the statue originally rose to a height of 17.3 ft – equivalent of almost two floors. Furthermore, from the historical perspective, the workmanship exhibited by the Shigir Idol aptly represents the refined scope of art practiced by the native fishermen and hunters of the Urals in the Mesolithic era. In fact, on many levels, it can be compared to the cultural achievements of the ‘sedentary’ farmers of the Middle East and Anatolia, including the builders of the Gobekli Tepe – the world’s oldest monument. As for the ambit of ‘encrypted code’ on the ancient wooden idol, historians have long been puzzled by the inscriptions on the statue. To that end, while the top part clearly comprises a three-dimensional representation of a human’s face, the rectangular profile along the ‘torso’ region is marked by variant geometric patterns. According to some scholars (like Professor Mikhail Zhilin, lead researcher at the Russian Academy of Sciences’ Institute of Archaeology), these etchings might have denoted some singular form of passing (spiritual or natural) knowledge, like the story of creation, down the generations – thus possibly entailing a unique communication system developed by the builders themselves. Painstakingly crafted from stones, these 9,000-year old artifacts were made by the early farmers of the Judean Hills region. In essence, there is a historical significance to these artifacts, given how the immediate ancestors of the prehistoric farmer-craftsmen in Levant were the ones (among many) to sow the ‘seeds’ of human civilizations by making the transition from hunting-and-gathering to introducing a range of founder crops like barley, lentils, chickpeas, emmer, and flax. 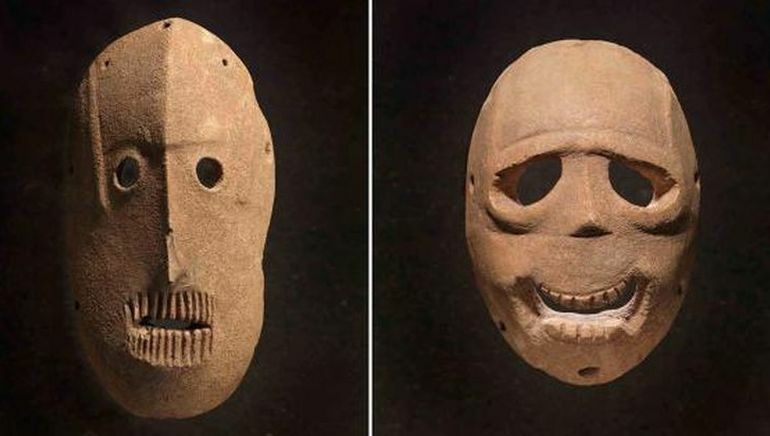 And beyond just chronological significance, these ancient Neolithic masks also allude to the development of culture and religion, as the objects probably symbolized the spirits of dead ancestors – and thus were possibly used in Stone Age rituals. 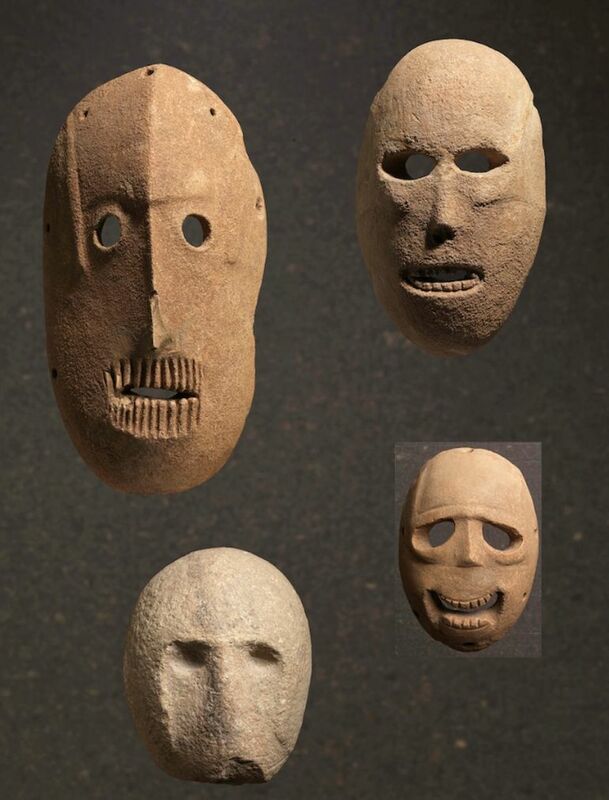 Now on closer inspection, there is no denying the sense of eeriness one could attribute to these Neolithic masks. In that regard, it is their ‘nakedness’ that may seem to be more menacing, as archaeologists had also come across tufts of dilapidated hair that were stuck to some of the masks but later removed on account of a 2014 exhibition. So in a manner, all of the masks represented adult males, with each originally having its set of facial hair including beard, mustache and possibly even hair. And rather notching it up on the sinister factor, the masks were probably modeled on actual human skulls (of old men), thus having realistic contours that mirror the prominent cheeks, temples, eye sockets, and even the teeth bared in their creepy grimace. 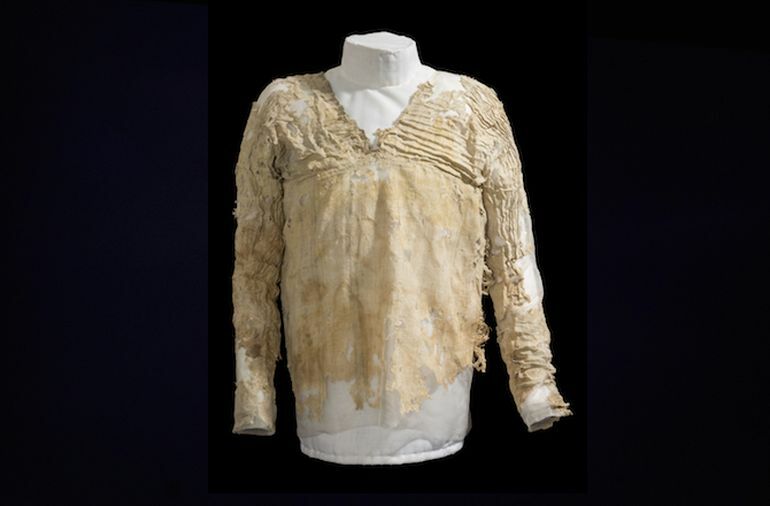 The survival of highly perishable textiles in the archaeological record is exceptional, the survival of complete, or almost complete, articles of clothing like the Tarkhan Dress is even more remarkable. We’ve always suspected that the dress dated from the First Dynasty, but haven’t been able to confirm this as the sample previously needed for testing would have caused too much damage to the dress. To determine the age of the Tarkhan Dress, which is currently kept at the UCL Petrie Museum of Egyptian Archaeology, a group led by Oxford University researcher Michael Dee analysed a small sample of the garment, in an attempt to measure the amount of radiocarbon (a particular radioactive isotope of carbon) still present in the linen. Made of flax fibers, linen is relatively easy to test via radiocarbon dating. According to the team, the dress contains signs of wear and tear dating back to when it was still new and was likely worn by a teenager or maybe a very slim woman. Mesopotamia, the cradle of civilization, boasts a lasting legacy that relates to many of humanity’s ‘firsts’. One among them pertains to a 5,300-year old tablet originally salvaged from the city of Uruk (in modern-day Iraq). Inscribed with the pictorial language of cuneiform, this artifact depicts a human head eating from a bowl and drinking from a conical vessel. The bowl represents ‘ration’, while the conical glass alludes to consumption of beer. And more than just this human visage, the tablet is also marked with scratches that basically record the quantity of beer assigned to each worker. 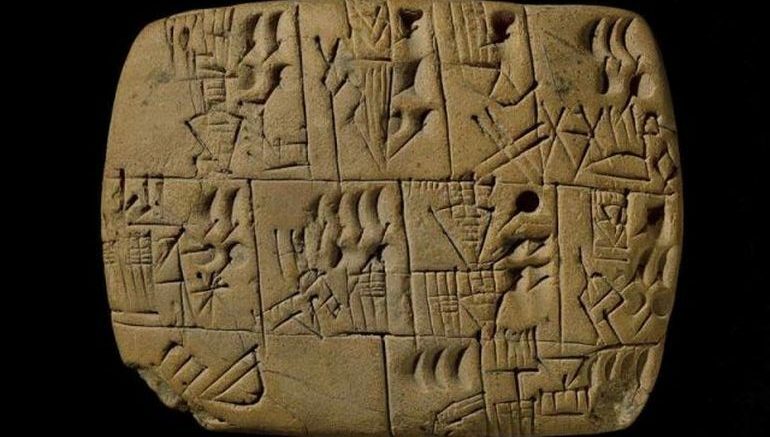 Simply put, the ancient Mesopotamian artifact is the world’s oldest known payslip that rather hints at how the hierarchical system of workers and employers existed even five millenniums ago – and they were possibly connected by exchange of beer (before the invention of token money). What’s amazing for me is that this is a society [in Mesopotamia, circa 3300 BC] where the economy is in its first stages, there is no currency, no money. So how do they get around that? Well, the symbols tell us that they have used beer – beer glorious beer, I think that is absolutely tremendous; there is no liquidity crisis here, they are coming up with a different way of getting around the problem of the absence of a currency and at the same time sorting out how to have a functioning state. As this society develops you can see that this will become more and more important and the ability to keep track, to write things down, which is a crucial element of the modern state – that we know how much money we are spending and we know what we are getting for it – that is starting to emerge. When it comes to the history of incredible inventions, advanced mathematics was one of the major developments that came out of Mesopotamia. Pertaining to this ancient scope, the Babylonians had been in the forefront of devising fascinating new mathematical systems, including what we know today as the sexagesimal (base-60) numeral system. And based on a recent research, the Babylonians may also have formulated the oldest known trigonometric table in the world. The hypothesis comes from the decoding of a 3700-year old clay tablet, known as the Plimpton 322 (P322) that had its origins in ancient Babylonia. Now while previously researchers were only able to connect the cuneiform script on the tablet with the core of the Pythagorean theorem (pertaining to the Pythagorean triples), a recent collaborative effort from University of New South Wales mathematicians Daniel Mansfield and Norman Wildberger led to some incredible insights. To that end, they were able to discern the descriptive patterns of 15 triangles forming right angles, with their angles of inclination decreasing incrementally. 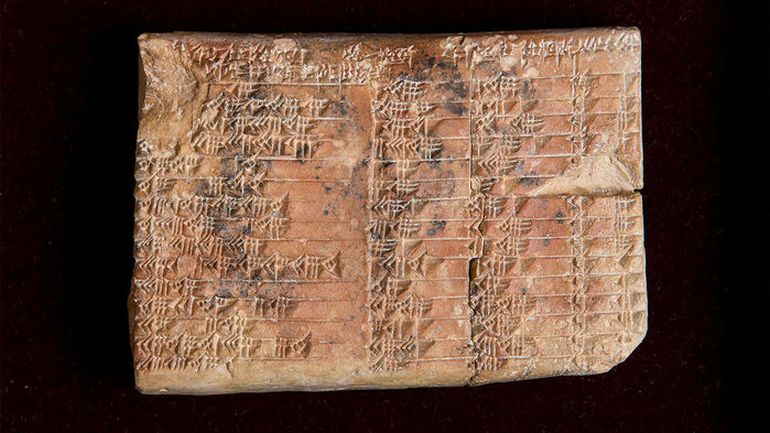 Essentially, as opposed to our popular notion of trigonometry entailing the use of familiar sines, cosines, and angles – partly influenced by the work of ancient Greek astronomers (circa 120 BC), the Babylonians opted for a system based on ratios (of sides). Simply put, like a trigonometric table, the tablet may have compiled the data relating to the known ratio of two sides that would have come in handy when finding the ratio of two other sides. 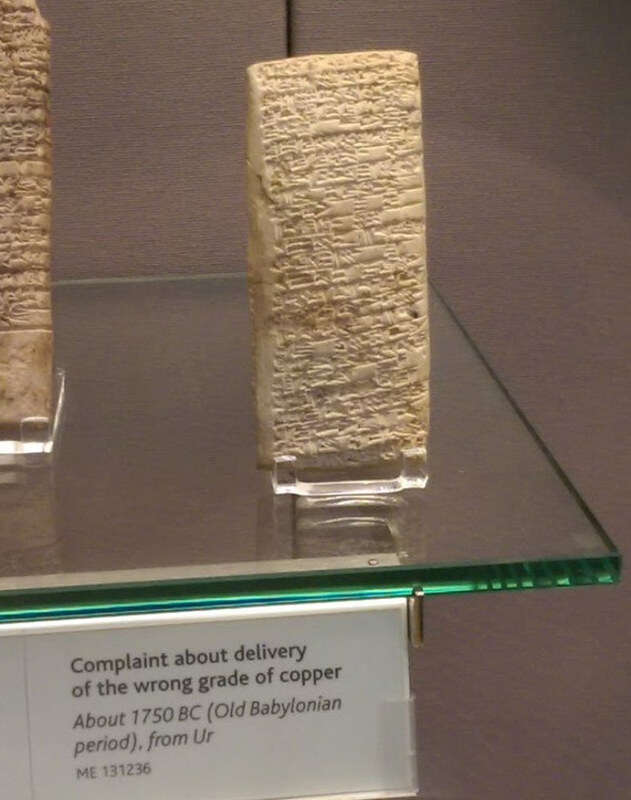 This clay artifact in question that rather mirrors our modern-day grievances, is Babylonian in origin (harking back to 1750 BC) and is currently kept in the British Museum. As for the inscription, the passage details quite a grudge-bearing customer complaint from one Nanni to one Ea-nasir, regarding two shipments of copper ore – considered as a very precious resource in the ancient world. This incredible tablet was originally discovered at the site of Ur – which was one of the Sumerian city-states (presently in southern Iraq) that had already lost its power during 18th century BC while being under Babylonian rule. And back in 2015, the ancient artifact/Customer Service Complaint was discussed in Reddit, with commenter labarna providing a full translation of the complaint. He reportedly made use of the book Letters from Mesopotamia by Assyriologist A. Leo Oppenheim. The smiling face is undoubtedly there. There are no other traces of painting on the flask. It has no parallels in ancient ceramic art of the area. As for the interpretation, you may certainly choose your own. The pitcher in itself might have been used to store sweetened beverage. 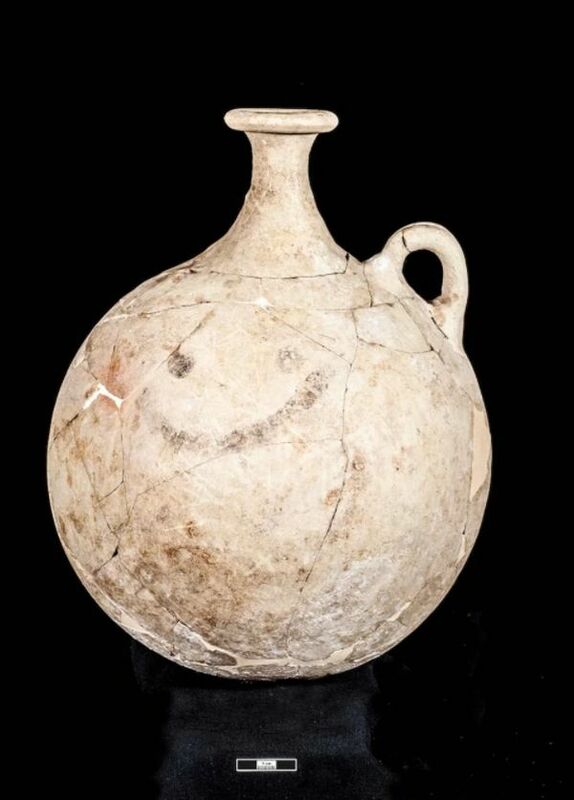 Additionally, the archaeologists also discovered a few others vases, pots and even metal objects in the vicinity. As for the historical perspective, the extensive perimeters of ancient Karkemish (roughly translating to ‘Quay of [god] Kamis’), stretched over 135 acres, thus being equivalent to the combined area of more than 100 American football fields. And interestingly enough, the settlement was inhabited from the Neolithic times, circa 6th millennium BC, till the late medieval times, thus being controlled by various factions ranging from Hittites, Assyrians to even Romans. 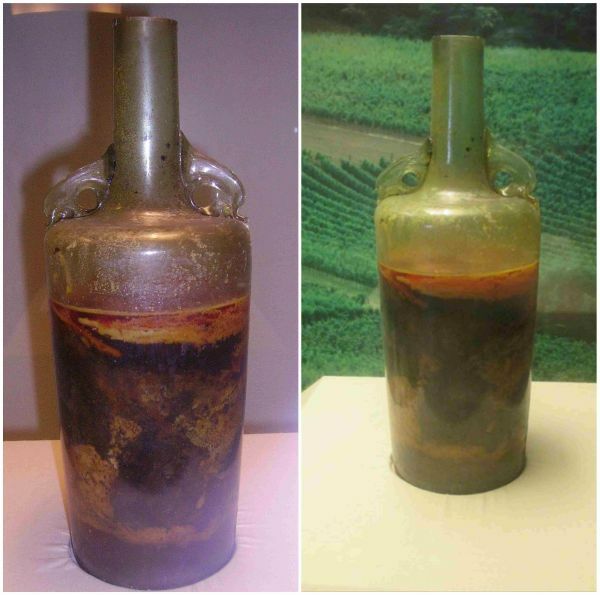 Bringing classiness back into culture, the world’s oldest known unopened bottle of wine is widely believed to the Römerwein, or Speyer wine bottle (named after the Speyer region of Germany). The ‘vintage’ object was originally discovered in 1867 from the Rhineland-Palatine area of Germany, inside the 4th-century tomb of a Roman noble. Befitting this ancient Roman heritage, the design of the decanter in question is pretty sophisticated with its hefty amphora-like bearing with dolphin-shaped shoulders, complemented by a yellowish green tint. And in case you are wondering, the 1.5-liter capacity glass vessel and its contents were preserved in an adequate manner with a special mixture entailing olive oil, along with a thick wax plug that sealed the bottle. As for the speculation surrounding the extant liquid inside the Speyer wine bottle, researchers have hypothesized that the content has possibly lost much of its ethanol volume, though the vessel might just still boast its fair share of actual wine fortified with various herbs. Pertaining to the latter, the ancient Romans were known to have added honey, seawater and even lead to their wine (for sweetening), along with dashes of spices and herbs for flavor (like lavender and thyme). Unfortunately, scientists have stopped short of actually analyzing the wine because of concerns over the potentially unstable interaction of the liquid with the outside environment – that could result in the irreversible deterioration of the entire content. 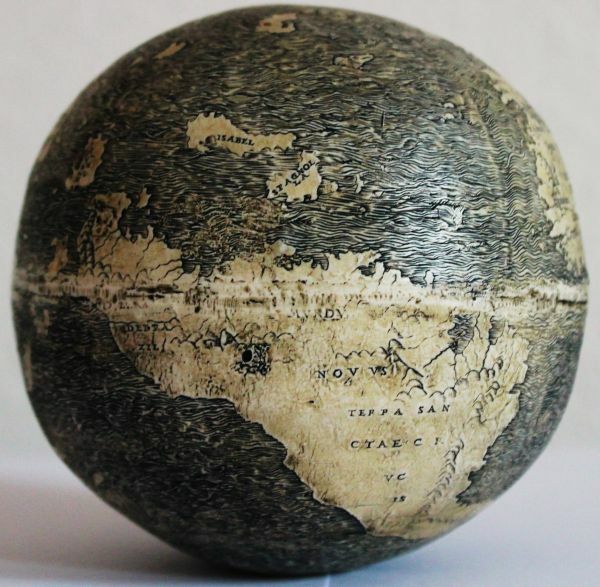 As it turns out, the oldest globe depicting the New World might pertain to an engraved ostrich egg! Originally purchased by an anonymous buyer at the 2012 London Map Fair, the Ostrich Egg Globe fortuitously made its way into the hands of Belgian scholar and collector Stefaan Missine. And after a year-long study and analysis (that involved over 100 other researchers), he was finally able to publish his results in Portolan, the journal of the Washington Map Society in 2013. Boasting the size of a full-grown grapefruit, the Ostrich Egg Globe dates from the early 1500’s (possibly between 1500-1504 AD) – as deduced by gauging the depreciating density of the organic shells (which equates to around 10 percent every century). In fact, it is the delicate material of the globe that has flummoxed many a historian, especially considering the well-preserved condition of the spherical object. In that regard, the construction of the artifact itself was achieved by conjoining two halves of an ostrich egg. Consequently, the globe’s northern and southern hemispheres comprise the roundish bottom sections of the organic eggshell. And intriguingly enough, from the historical perspective, the Ostrich Egg Globe not only predates the previous record-holding globe for the oldest depiction of the New World, but it might have even served as the prototype for the latter specimen (known as the Hunt-Lenox Globe – possibly made between 1504-1510 AD). In that regard, the researchers have identified how the representation of the world geography in both the globes is almost identical, ranging from the ocean wave patterns to the contours of the odd-sized continents. The Hunt-Lenox Globe made of copper also consists of the same spelling errors like ‘HISPANIS’ instead of HISPANIA and ‘LIBIA INTEROIR’ in place of LIBIA INTERIOR.